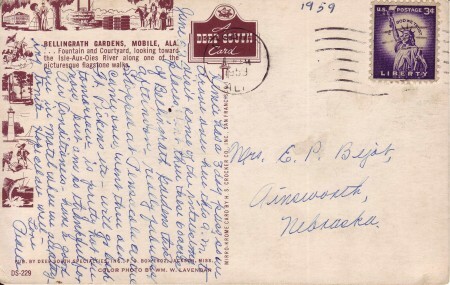 This week’s postcard was sent to Mrs. E. P. Bejot in Ainsworth, Nebraska on June 23, 1959. Fountain and Courtyard, looking toward the Isle-Au-Oies River along one of the picturesque flagstone walks. Pub. by Deep South Specialties, Inc., P.O. Box 1802, Jackson, Miss. 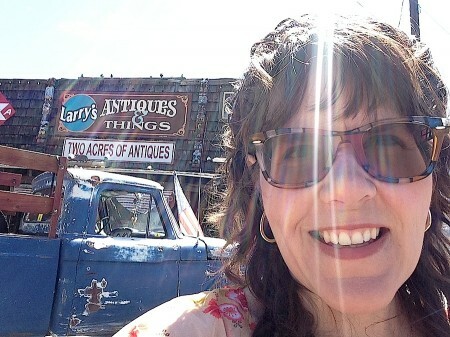 Henrie has a 3 Day Pass, so we drove over here this a.m. to visit some of the interesting places. 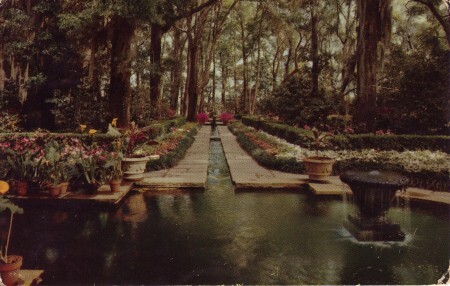 Went thru these 60 acres of Bellingrath Gardens this afternoon – really fabulous. Stopped at Pensacola as they came over, went thru old J. R. Pickens, etc. – will go back tomorrow. Is pretty hot here now but am so thankful for air conditioners – have a good one in motel where we are staying tonite. Hope all are well. Pearle sent many postcards to Mrs. Bejot over the years and this one is beautiful. She must have been a devoted friend/daughter/sister. However they were related, Mrs. Bejot saved Pearle’s postcards with care. Bellingrath Gardens still enthralls visitors today. 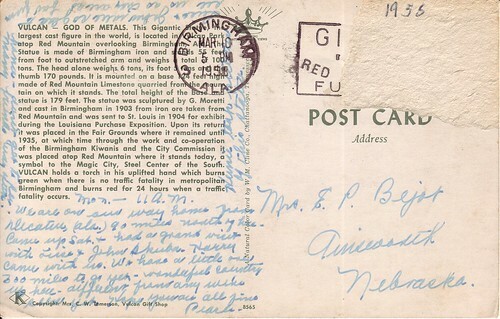 This postcard was sent from Birmingham, Alabama to Mrs. E. P. Bejot back on March 5, 1958. VULCAN – GOD OF METALS. 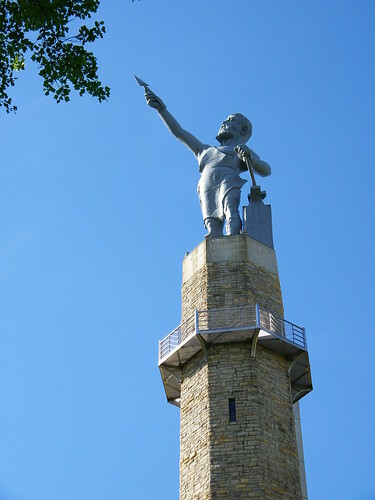 This Gigantic Statue, the largest cast figure in the world, is located in Vulcan Park atop Red Mountain overlooking Birmingham, AL. The Statue is made of Birmingham iron and stands 55 feet from foot to outstretched arm and weights a total of 100 tons. The head alone weighs 6 tons, its foot 5 tons and the thumb 170 pounds. It is mounted on a base 124 feet high made of Red Mountain Limestone quarried from the mountain on which it stands. The total height of the base and statue is 179 feet. The statue was sculptured by G. Moretti and cast in Birmingham in 1903 from iron ore taken from Red Mountain and was sent to St. Louis in 1904 for exhibit during the Louisiana Purchase Exposition. 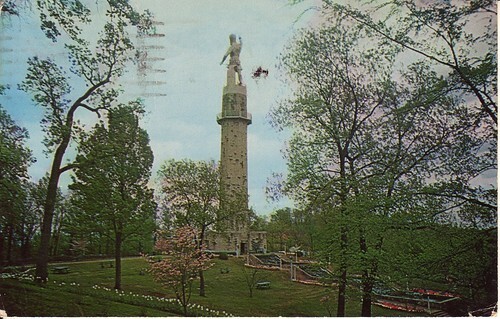 Upon its return it was placed in the Fair Grounds where it remained until 1935, at which time through the work and co-operation of the Birmingham Kiwanis and the City Commission it was placed atop Red Mountain where it stands today, a symbol to the Magic City, Steel Center of the South. VULCAN holds a torch in his uplifted hand which burns green when there is no traffic fatality in metropolitan Birmingham and burns red for 24 hours when a traffic fatality occurs. We are on our way home from Decatur, Alabama. 90 miles north of here. Came up Sat. and had a grand visit with Lois and John Skuba. Harry came with us. We have a little one. 300 miles to go yet. Wonderful country up here – different from any we’ve been yet. Hope you are all fine. Heince took pictures of this state. Lois and John were so glad to see us as they are far from home – don’t get to see many friends from very often.